Johannes Brahms' late chamber works are surely among the most splendid music ever written for the clarinet. In the last years of his life, Brahms seems to have become weary of composing – but fortunately for posterity, in 1891 he met the solo clarinettist of the Meiningen court orchestra, Richard Mühlfeld, whose mellifluous art of performance captivated him and inspired him to new works. The Trio, Op. 114 is melancholy and autumnal in character, and is loved by all clarinettists. It is now available from Henle in a revised edition. 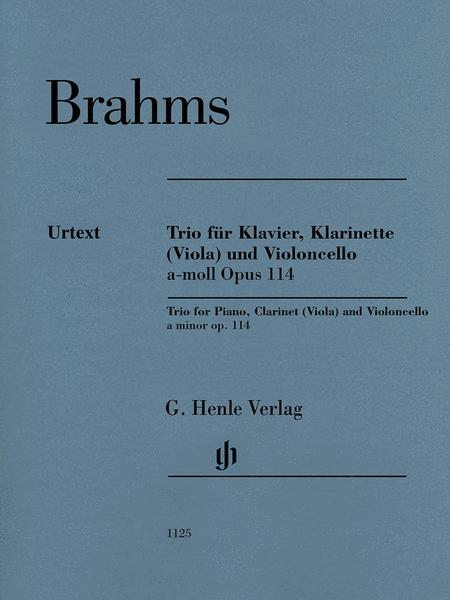 The musical text follows that of the New Brahms Complete Edition, and thus guarantees the highest degree of precision and reflects the current state of research. The pianist Klaus Schilde has added valuable fingerings to this Urtext edition.